Short-term radio usage to cover a large distance has proven to be a problem for users or organisations who may be attending/organising an event. 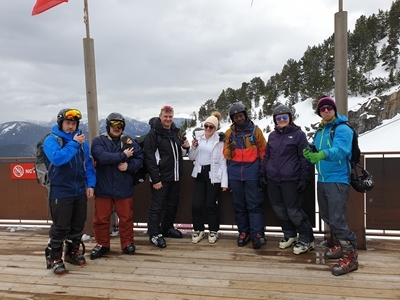 Maltings Academy, Essex, faced this exact issue on an upcoming ski trip to Andorra as they needed to ensure their pupils and staff safety by maintaining contact with each other throughout the ski resort. In the past, the staff used mobile phones which had proven to give them the range they desired but only offered one to one communication as well as a dial-up wait time. The Academy ideally wanted a cost-effective simple solution where multiple calls were possible and large distances were covered. Standard two-way radios offered multiple calls and no dial-up but did not have the range required to cover the ski resort without a costly infrastructure being in place. Due to the Academy only needing communications for the duration of the trip, this was not an option for them. Maltings Academy contacted Essex Radio Hire with their issue who supplied Icom LTE radios. The IP501H LTE Radio Handheld met the Academy’s needs as it allowed them to perform ‘Individual’ and ‘Group Calls’ to their staff members, no dial-up time and the radios covered the whole range of the ski resort. All the staff had to simply do was turn the radios on and start transmitting, no licence required. For more details about Essex Radio Hire & Sales visit their website at www.essexradiohire.co.uk/. For more details about Icom’s new PoC radio system visit the dedicated web pages at icomuk.co.uk/LTE_PoC-Radio-System.